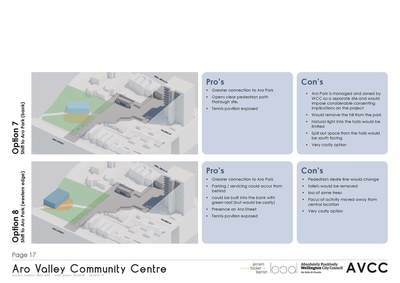 In February we narrowed our options down to two possible concepts for a refurbished Community Centre. Now we need to choose one final option that the design team will take forward. 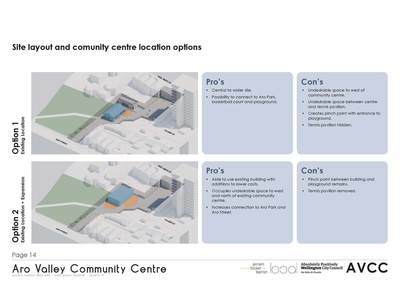 This is the key decision point of the process, as it will be AVCC's endorsement to WCC of a single design option. Meeting will receive information on the two options, discuss them and then choose one. After this those present will have a chance to provide more detailed feedback on the chosen design. The meeting will also discuss how the project will proceed once a final option is chosen. 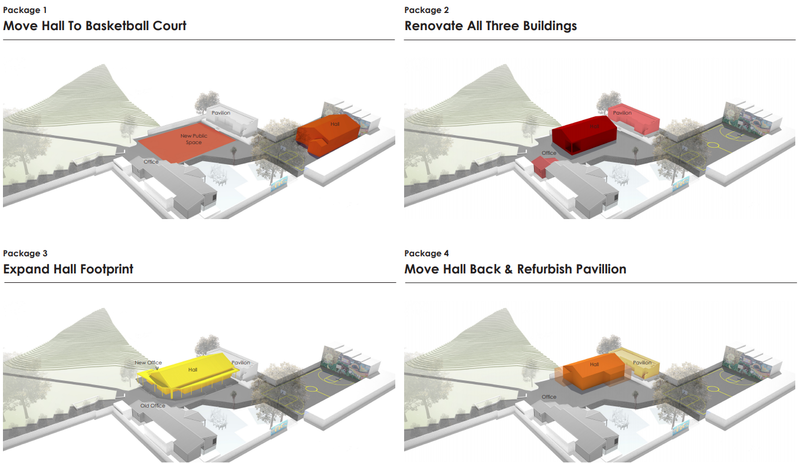 The proposed designs are given below. 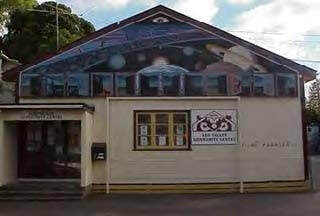 You can also find the designs on the windows of the Aro Valley Community Centre at 48 Aro Street. 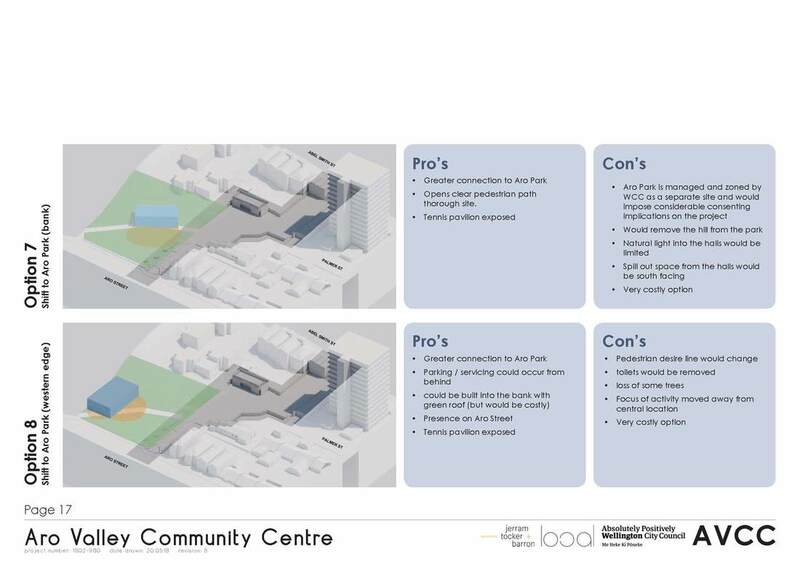 Please have a look when walking past the Community Centre and provide your feedback at the General Meeting. This is a General Meeting of the Aro Valley Community Council. 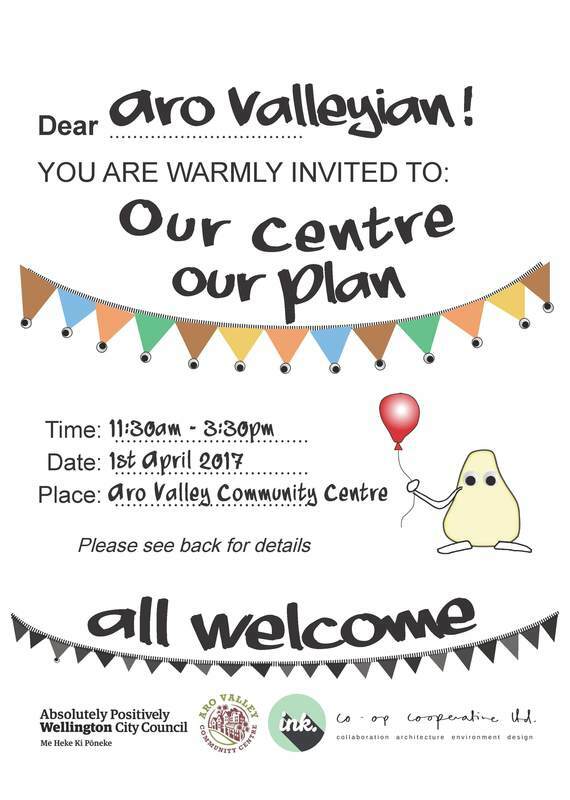 Everyone who lives, works or owns property in the Aro Valley is welcome to participate. 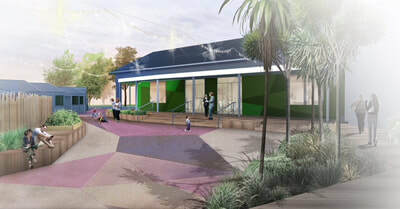 Our community is looking at four packages for changing up the community centre and its surrounds. The meeting on Saturday 9 February 2019 at 10.30am | Aro Hall will choose two for further development. The other two will be discarded. If you want to have a say in what happens, you need to be at the meeting. This is the first community decision-point in a process that will conclude at the end of March. At the next meeting the community will choose again - this time it will be between 2 designs developed from the 2 we choose. These will be more developed, so you can see interior and exterior features. Over the last three years, there has been a great deal of community engagement and discussion and we are now in the decision phase. How can I prepare for the 9th of February? Take a look at the four packages below. 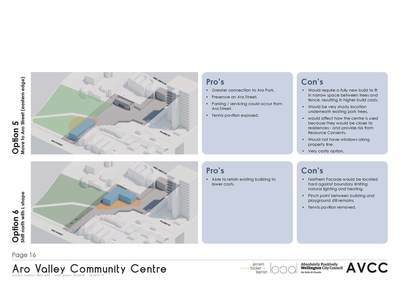 Read the summary information about how each delivers against the key community criteria drawn from almost three years of feedback and discussion. Think about what more you need to know to help you choose. 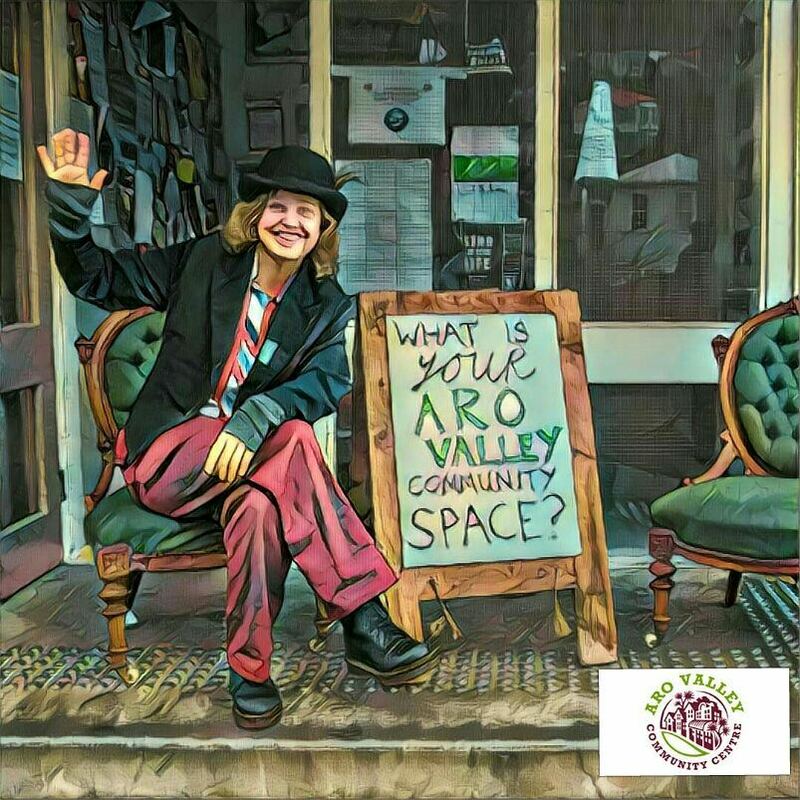 Bring your questions to the General Meeting on Saturday, 9 February 10.30 at Aro Hall so we can have a good discussion and together as a community narrow our options down to two. If you want more background have a look at the rest of this Site Development page - it holds loads of treasures about the two year process we have been on to decide how we should use the grant of $1.2 million that has been offered us by the Wellington City Council. What happened at the 15 December 2018 meeting? This meeting introduced the four packages and people were asked for feedback. This will help with final design on whichever package is chosen. This feedback is summarised on a document below. This meeting also helped your elected Steering Groups test whether there were major gaps or options we had overlooked. After reading the feedback, we are bringing the four option to a decision-making meeting so the community can make a final decision. 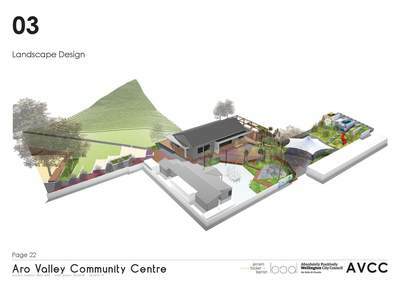 The Aro Valley Community Centre is receiving a $1.3 million upgrade. 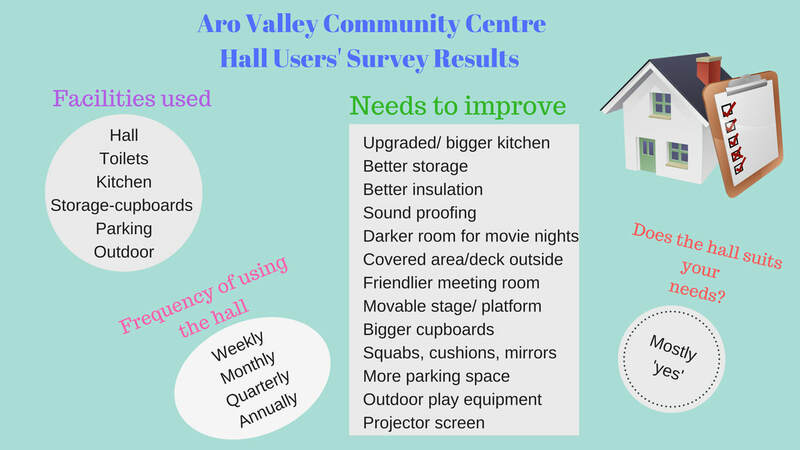 After a review of the community facilities in Wellington, the City Council has partnered with Aro Valley Community Council to direct the allocation of these funds into a centre that allows the Aro Valley to meet the growing needs of our community. 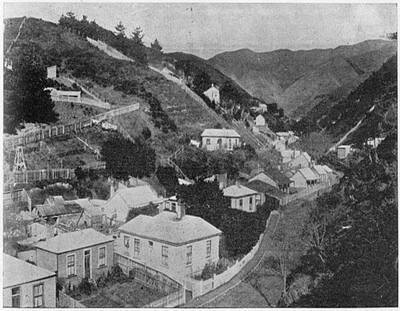 To ensure the spirit of Aro Valley is captured in the design, the Aro Valley community has been actively involved in the design process. 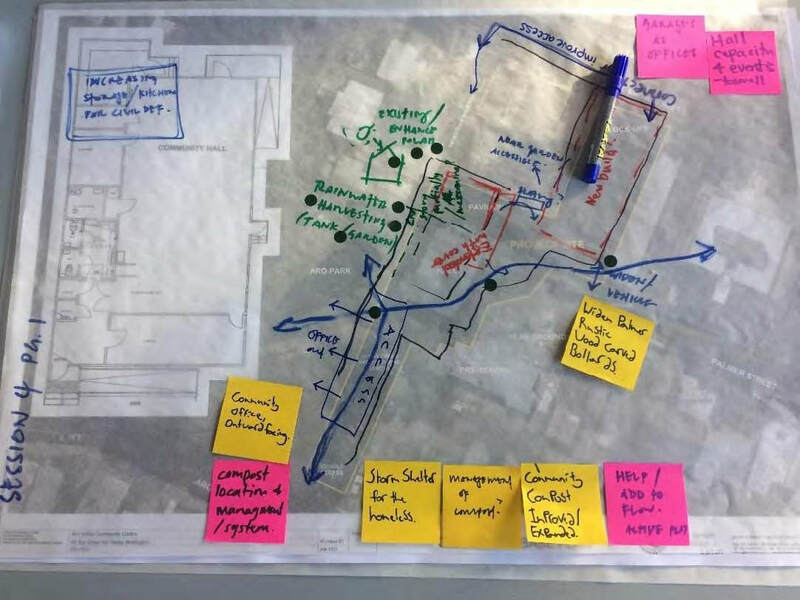 Ideas came together through general meetings, events, interviews, online questionnaires, interactive workshops and a historical investigation of the site. 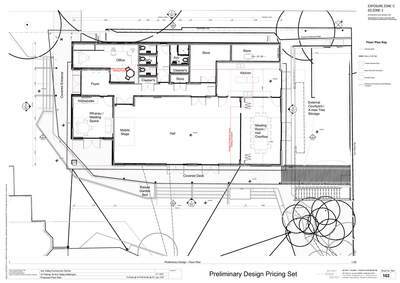 The information gathered formed a brief for the project, your ongoing engagement continues to give direction to evolving designs. ​This page receives regular updates from events and decisions throughout the process and contains important documents. 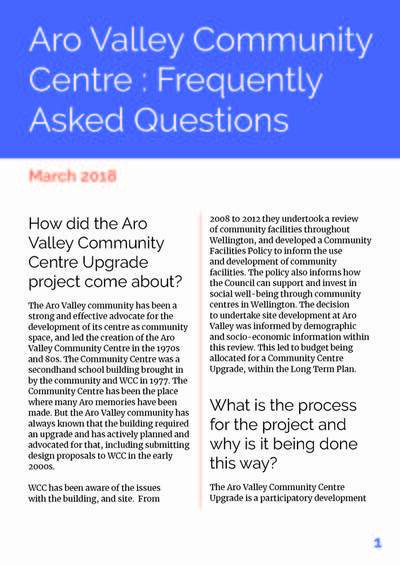 PLease take the time to read the media releases below "An update on the Aro Valley Community Centre Upgrade". This page reproduces a special edition of the Valley Voice that is an update of the story so far. 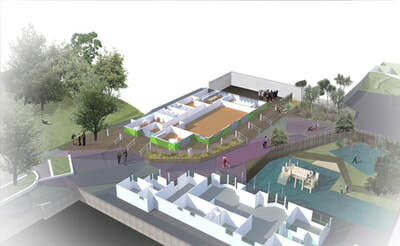 It seeks to increase understanding of the project and celebrate the design the community has created. At the end of this newsletter is a link to a survey and are some next steps on how you can continue to have meaningful input. The fun part is about to begin! 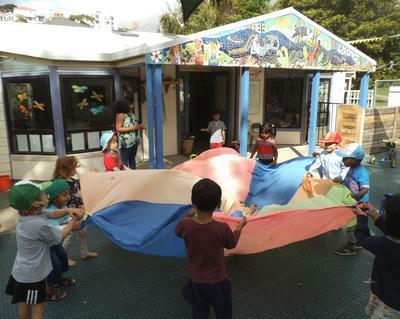 Aro Valley residents have forever been a strong advocate for an open and inclusive community centre. 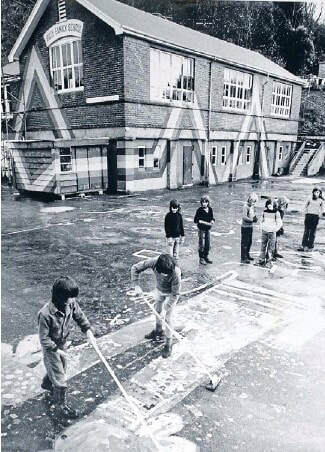 As a result, the empty Matauranga school on Aro Street was acquired by the Council in 1974, and the old tennis courts of the Wellington Lawn Tennis Club were transferred to Parks and Reserves for use as a temporary children’s playground. 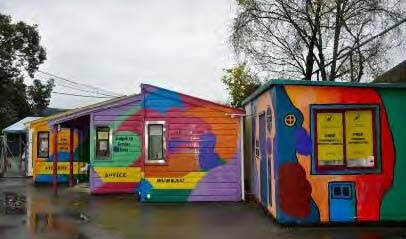 In 1977, a second hand prefab classroom was brought onsite which serves as the community centre today. 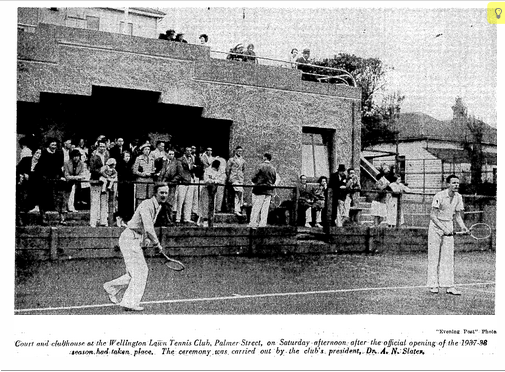 The classroom was placed on the tennis courts in front of the pavilion, now known as ‘the bunker’. The hall was badly fire damaged not long after it was set up on site, and repairs were the first big job. 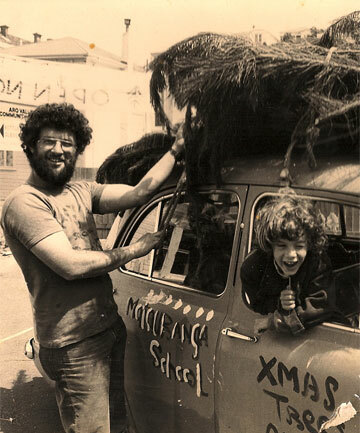 Aro Park was created in the 1980s following the demolition of the Matauranga school. When the community heard of the Salvation Army‘s plans to build their citadel on this site, they banded together. Community leaders dug up the asphalt in the middle of the night and planted trees as a symbol of the park and community space they imagined for the future. 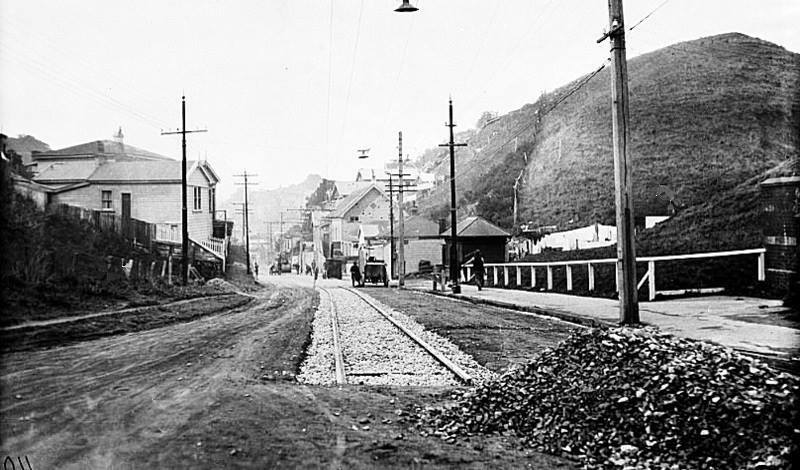 Our current walkway from Aro Street to Palmer Street, didn’t exist until this point. The old classroom hall has seen several modifications some involving community contributions of funds and labour. Significant upgrades were carried out during 2006/2007 and 2011 and the preschool (which used to operate from the hall) received its own building. The Victoria University School of Architecture has been involved more than once in helping to design the centre. ​Did Iona just dump the money on us or did we ask for it? 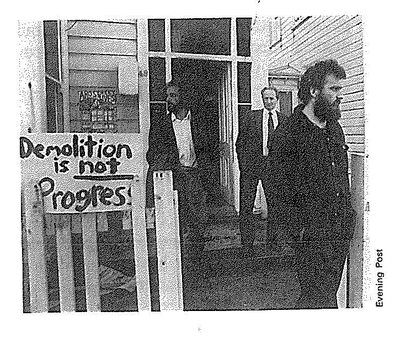 Wellington City Council is aware of the current issues with the building, and site. From 2008 to 2012 they undertook a review of community facilities throughout Wellington and as a result identified Aro Valley as one of three suburbs that did not have community spaces and or centres that met the local community needs. The decision to undertake site development at Aro Valley was informed by demographic and socio-economic information. 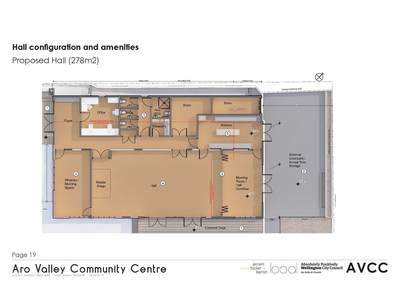 Funding was allocated across three years with the intent to upgrade our community facilities to better meet growing community needs using co-design process. 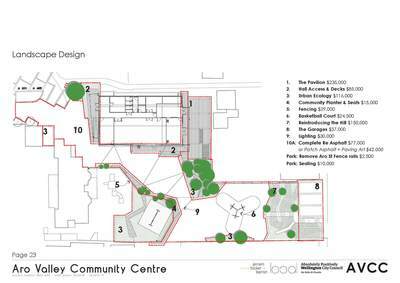 What makes a good community centre? 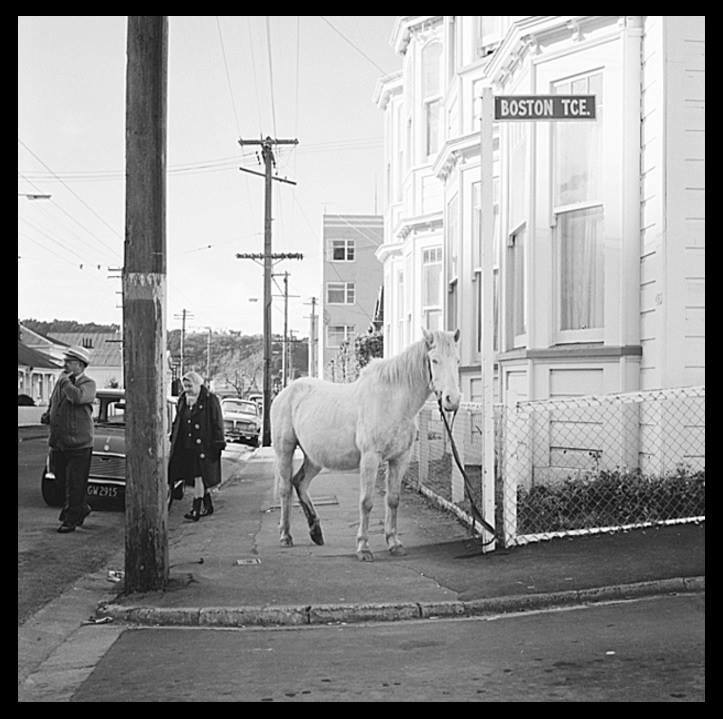 He tangata, he tangata, he tangata. 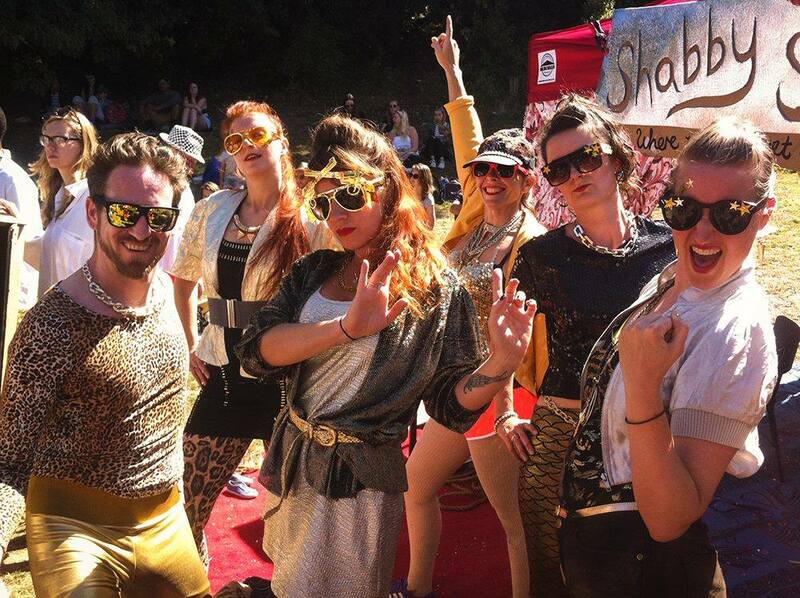 People make a good community centre. ​However, upgrading the buildings will help the community thrive - for instance providing more spaces to meet and keeping us warm when we do. - community appetite for future development was understood and conversations with all stakeholders e.g Aro Valley Preschool and Te Aro School were started. 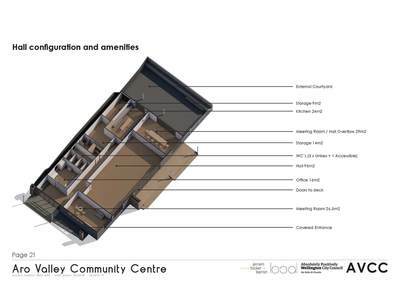 - Any changes would reflect the use of the community space. Anne Cunningham and Cally O’Neil were brought onboard at this point. 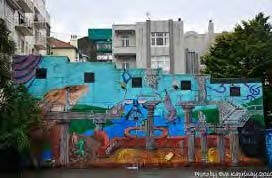 They are community developers and facilitators with experience in urban design. They began by scoping the intent with the AVCC sub-committee in Sept 2016. 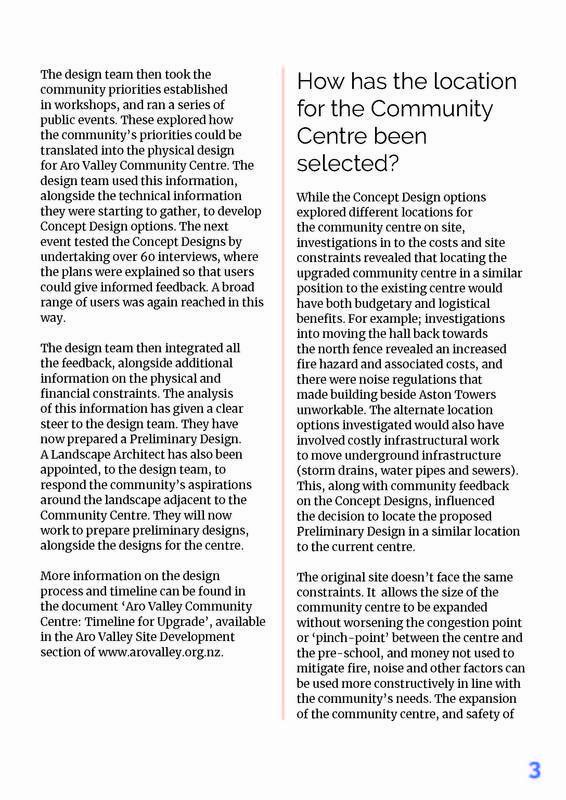 AVCC briefed them on their understanding of the Aro Valley community, and how the site affected Aro Valley. They had access to WCC statistics and the archived history of the site. They tested this understanding by engaging with the wider community. Interviews were carried out with various members of the community: those involved in earlier engagement, everyday site users, passers-by, preschool families and those in transit through the site. A weekend long Festival of Place (Nov 16) followed to provide opportunities for the community to publicly discuss and record their perspective. The work was done on site, so the conversations were clear. There was a wide range of different materials to contextualise issues and ideas within physical spaces e.g maps, models and photos were used as prompts to extend discussion and explore concerns in detail. There was an online and paper survey, and a social media campaign for advertising workshops. Committee members conducted further interviews with stakeholders and people known to be hard to reach. These events and initiatives enabled the community to discuss Aro Valley with each other and provided opportunity to record ideas and hear from each other our preferences, issues and risks. Each event attracted between 35 - 100 people. They were advertised via posters, email, newsletter, social media and mailbox drops. 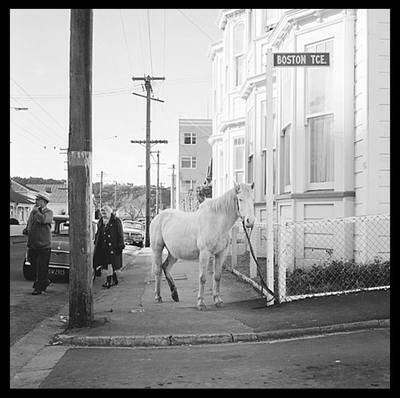 There was diversity in who came e.g hall users, residents of Aston Towers, people experiencing homelessness, preschool staff and parents, children, cyclists, basketball players, past and present community centre staff and volunteers, Kai O Te Aro gardeners and our neighbours on Palmer Street to name a few. 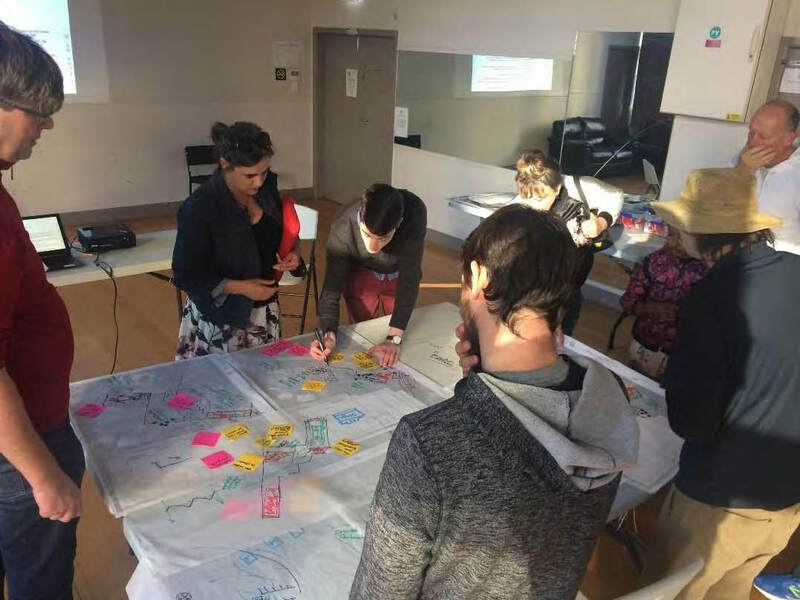 The next public workshop “Our Place, Our Plan” in April 2017, took the 300+ ideas generated from this and developed them in to a series of priorities (see over page). 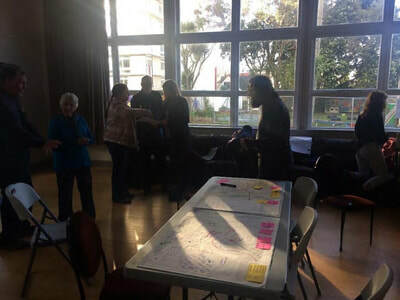 At this workshop the community explored relationships with different ideas and developed a list of principle themes and specific facilities they wanted developed. These formed part of the backbone of the design briefing, which went alongside the technical and financial constraints for the site. How was the preferred design identified? 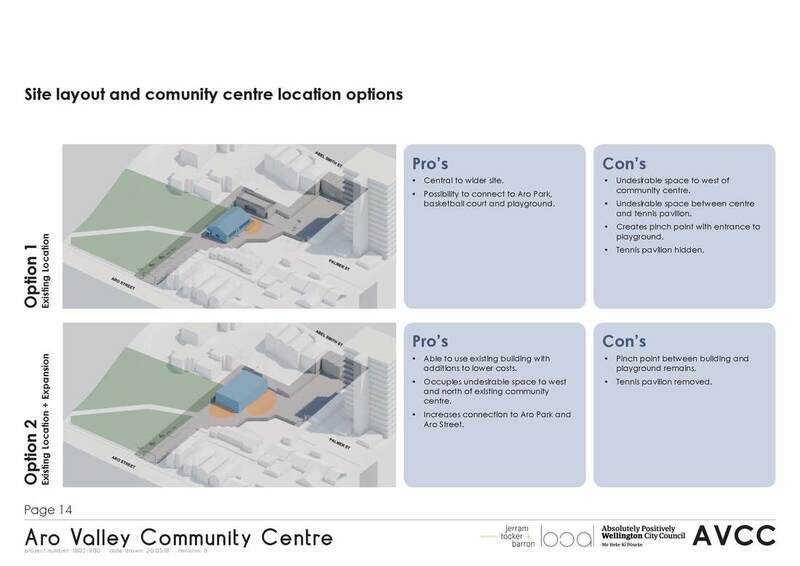 ​While the concept design options explored different locations for the community centre on site (see over page), investigations in to the costs and site constraints revealed that locating the upgraded community centre in a similar position to the existing centre would have both budgetary and logistical benefits. Once the technical information and community feedback were reviewed by the steering committee a costing exercise was undertaken. 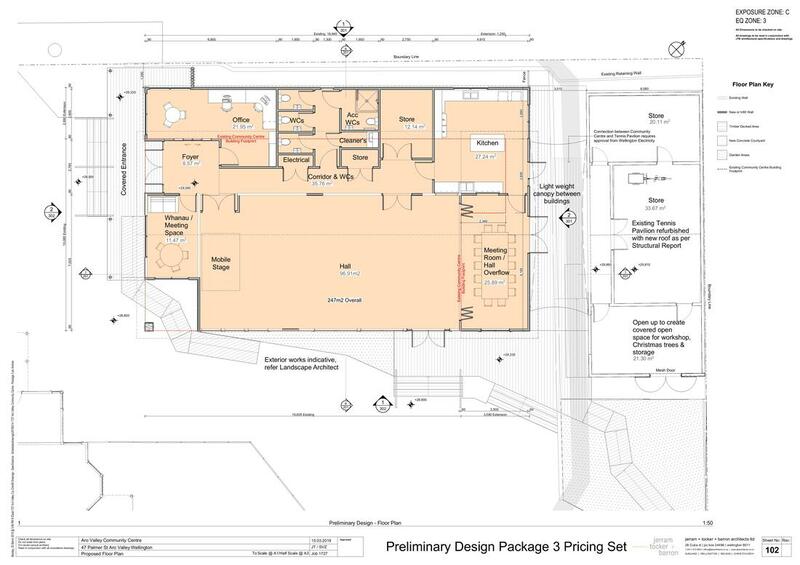 All Concept Designs came in over budget, including estimates for new buildings. These concepts were presented to the community to gain feedback of the portfolio of ideas they showed, so the engagement acted as a strong guide to the next stage. This indicated that the preliminary design should be developed based on Concept One and that reusing suitable features, such as the roof to reduce waste, and leave more of the budget for other features the community have requested. Other areas to reduce the costs were indentified where the Aro community can contribute: eg landscaping, planting, artwork, painting. 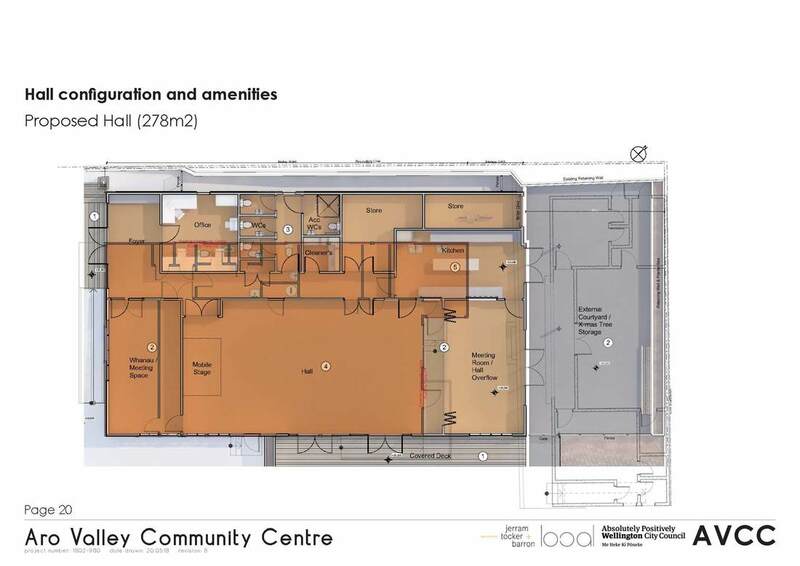 During the development of the building and landscape proposals there have been additional works identified beyond the minimum upgrade to the community centre amenities. These are the “nice to have” items as opposed to the “must haves”. 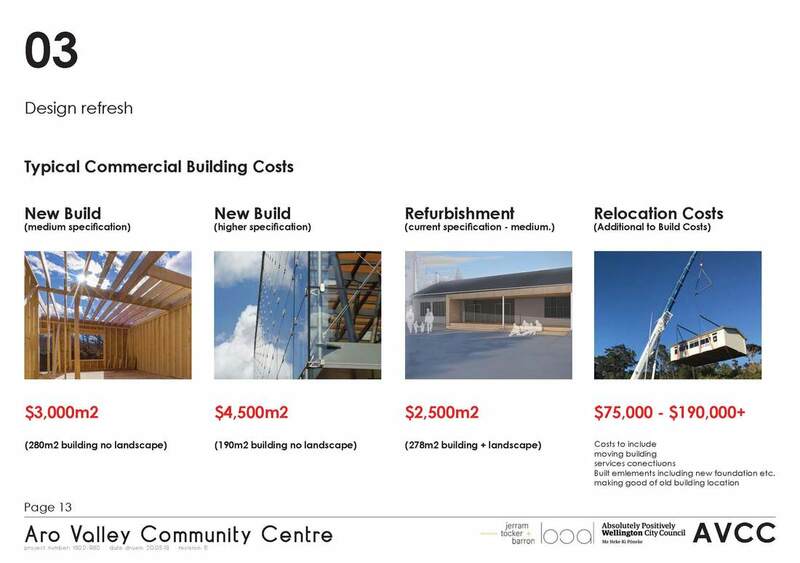 With the benefit of the QS estimate Aro Valley will soon be able to work with architects to prioritise these elements knowing their estimated cost, and potential contributions from the community. Once a list of priorities is agreed upon, there will be a budgetting exercise to determine what can be incorporated into the first round of work. 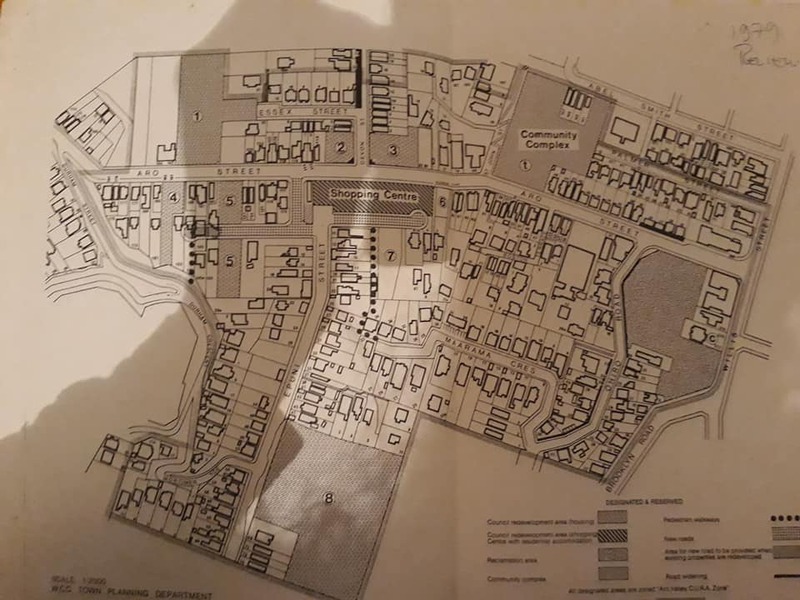 Other items can follow on at a later date, and there are also some items (eg garages & playground 2020/2021) that have a separate budget and timeline. The details will be important, and will be where members of the community can contribute to their area of interest. The bunker (ex tennis pavilion 1937) is not occupiable in its current state. The roof and interior space need large and costly renovations to make it usable and safe for future generations. The preliminary design proposed its removal and the majority of community participants support its demolition. The current design proposes a covered multipurpose outdoor space that retains parts of the bunkers structure. ​How can I be more involved? 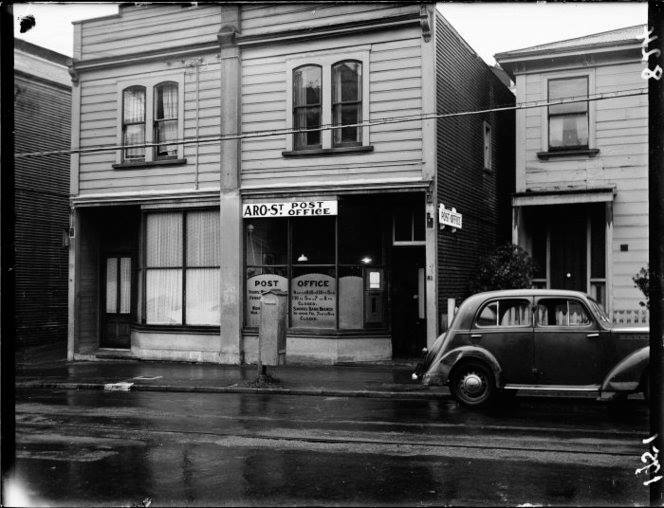 The site at the Aro Valley Community Centre is rich in history and narrative. It wouldn’t exist without the actions of committed community members who fought for its establishment and helped form and evolve the relationship with the the Wellington City Council. 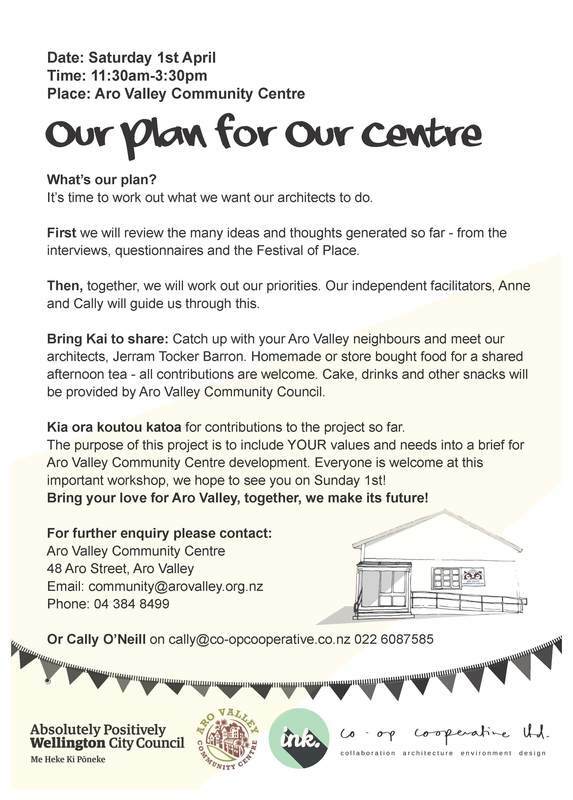 To inform the architect’s brief, the community put forward the values and priorities of Aro Valley. Collectively, the steering committee have heard hundreds of ideas - these were collated and catagorised by the community. 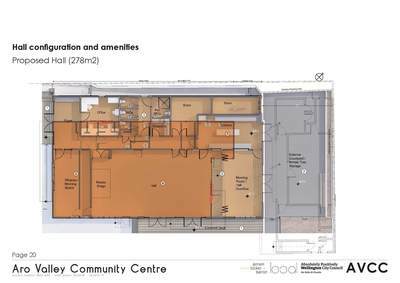 A new design for the upgrade of the community centre is proposed, taking into account the site’s considerations and constraints. There’s still a lot of meaningful input you can have! 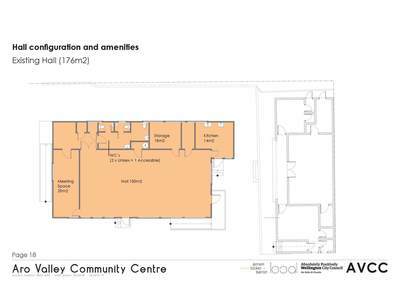 You’re invited to participate in user groups to evaluate specific functions of the community centre. Your feedback will inform the detailed design phase of this upgrade. I wanna help build it! Sign up to volunteer your labour on the project. You can watch the entire General Meeting about the Site Development below. You can also access an excel document of the notes from the cynic and believer activities and discussions here or see them for yourself, cynic and believer image 1, image 2. 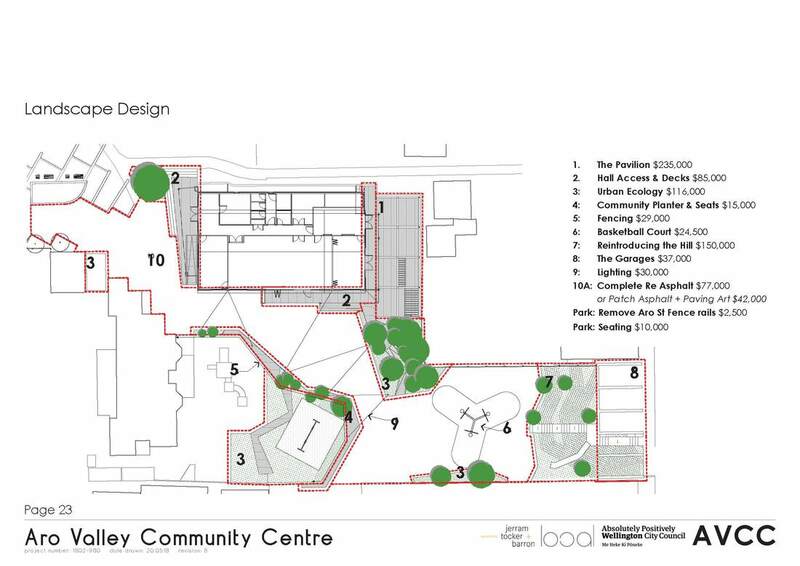 The following pages illustrate lots of opportunities and options for what is possible, within the landscape around Aro Valley Community Centre. 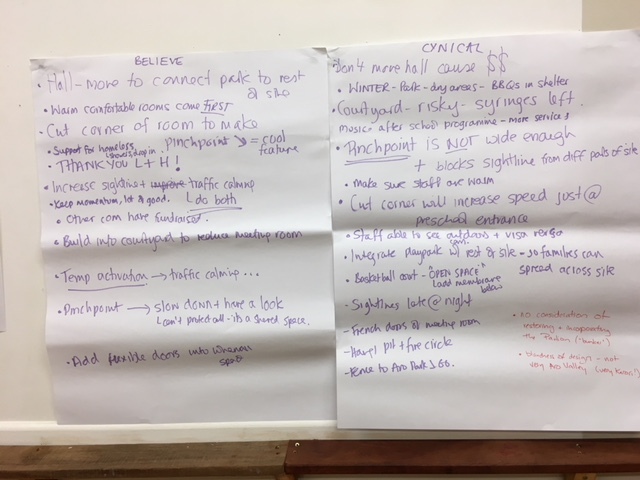 These are based on discussions with community members, the previous engagement interviews and workshops and our thoughts and observations from the site. The drawings are our way of inviting a conversation with you about what can happen in this project, and what you want to work towards in the future. 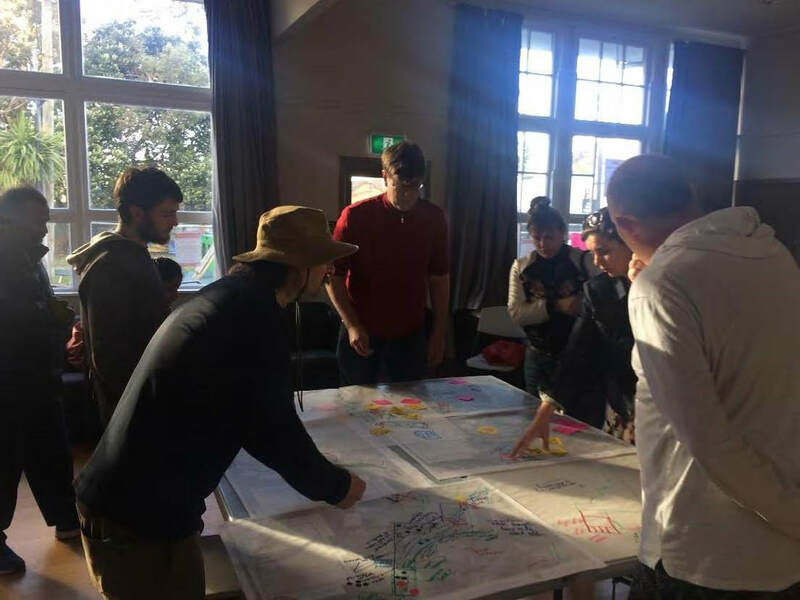 So we have included ideas of what can be done within this project, and ideas to stimulate future community-led projects. What is not built, as part of this project, may be excluded for two reasons: it maybe a bad idea, or maybe something that can be added over a longer period through community efforts or perhaps you can develop separate projects / funding. You may even find people here today who want to work with you on one of these. 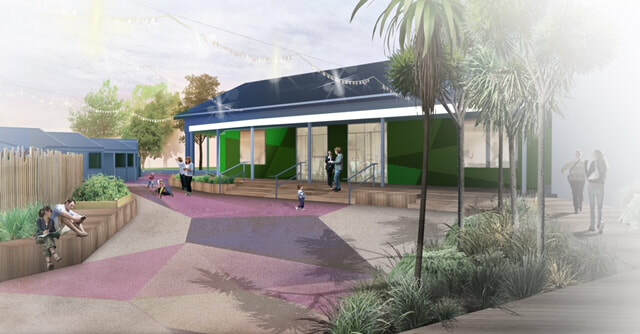 The project to upgrade the Aro Valley Community Centre is underway, and we are now at the Preliminary Design Testing phase. In this phase, the Preliminary Design is presented to the community and feedback is welcomed. This update shares site development design material and communications that have been compiled and summarised by the project consultants. Each link opens a PDF document in a new browser tab. A meeting where the community can hear from the project consultants and give their feedback in person will be coming shortly - watch this space! 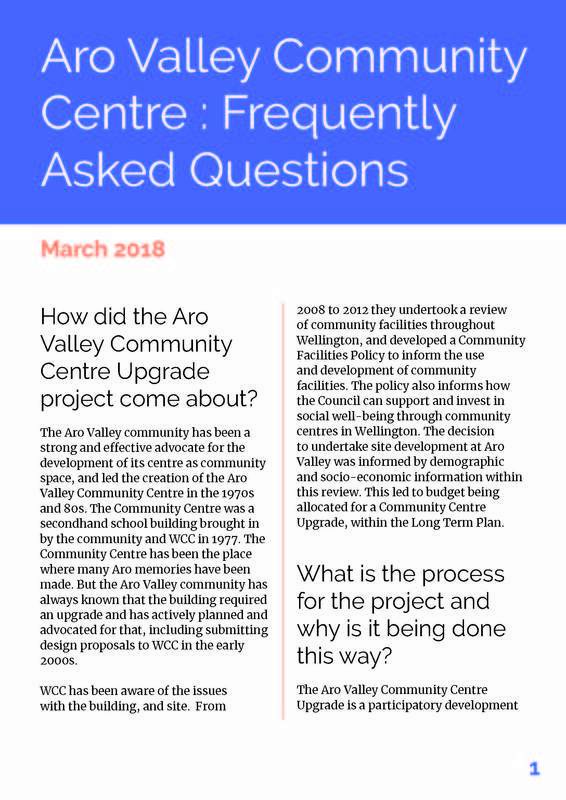 In December 2015, the Wellington City Council (WCC) informed the Aro Valley Community Council (the AVCC) it had earmarked $1.2 million dollars for an upgrade of the Aro Valley Community Centre buildings and facilities. The money is to be spent over three years and in three phases. 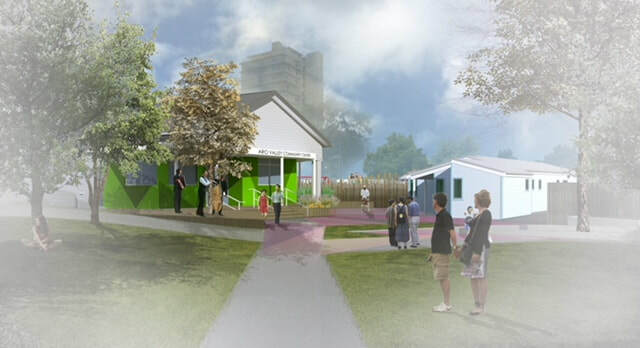 The WCC is supporting this project as a community-led design process. The plans will be inspired by community needs and future vision. 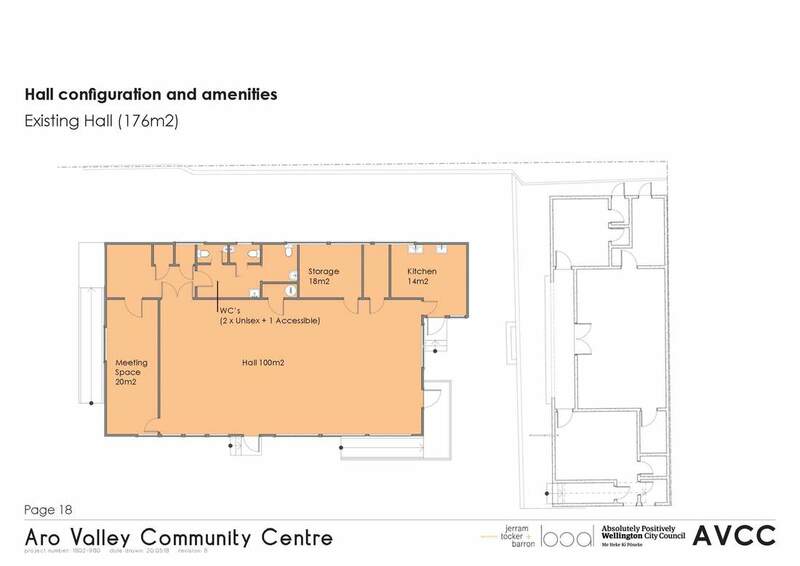 Ideally this will ensure that the facilities support and encourage a strong and connected social environment. WCC is funding the project through its Long Term Plan 2012-15 allocation: click here to read the Long Term Plan 2012-22 (see pages 83-85). The project is governed by the AVCC and WCC through a steering group with representatives from each organisation. The aim of the Steering Group is to oversee the process from early engagement through to developed design. Ultimately it will recommend a preferred option to WCC. 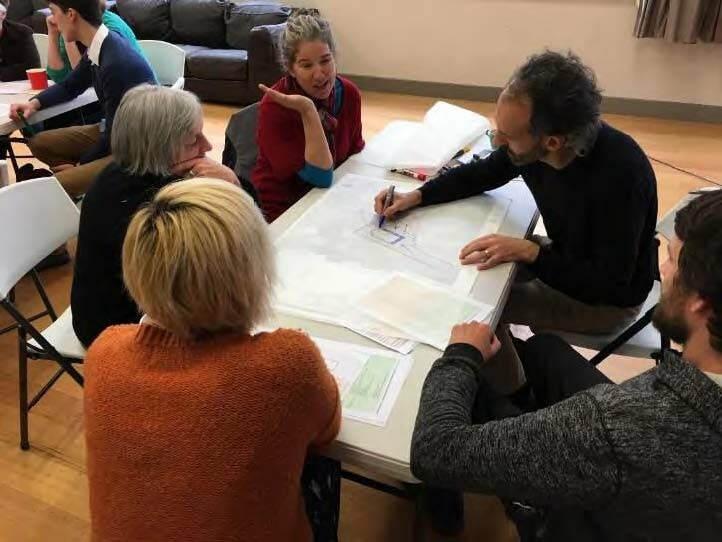 The Steering Group is responsible for ensuring the community is consulted about design options and are encouraged to be involved in the implementation of the design. The community centre is operated by the AVCC, with funding from WCC to support community activities and community development. The AVCC is made up of elected residents. Five members of the AVCC formed a sub committee to provide support for and manage the project – Luke Allen, Hilary Unwin, (co- chairs) Rachel Griffiths, (treasurer) Sacha Green and Jo Brien. The subcommittee report to the AVCC and the Steering Group. WCC owns the site and maintains the community buildings. 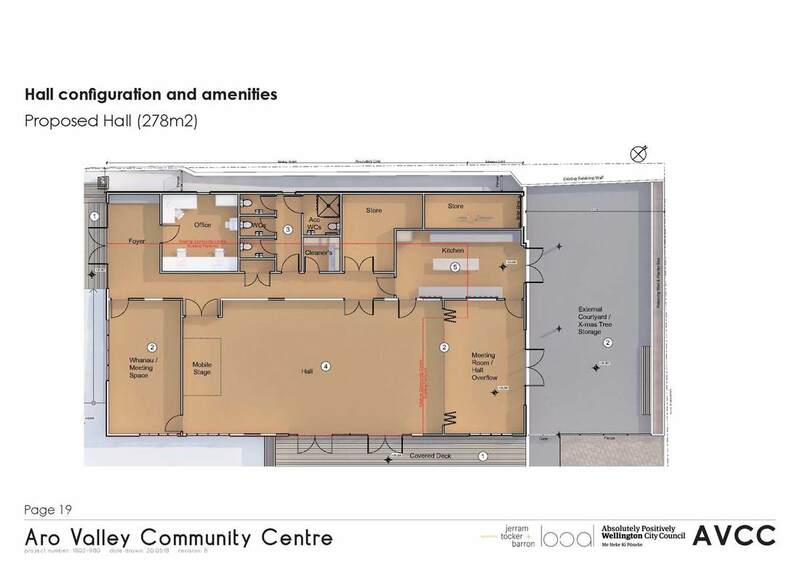 WCC Community Services and Property teams support the project as members of the Steering Group, and maintain links to related Council officers. The AVCC subcommittee ran a stall to initiate community thinking about the project. A questionnaire was given out to fair goers for feedback on use and comments regarding the site. The subcommittee ran a general meeting giving an overview of the project, estimated timeline, and an explanation of the community engagement. The first phase involves engaging with the community, determining values and needs and transforming these concepts into a design brief. 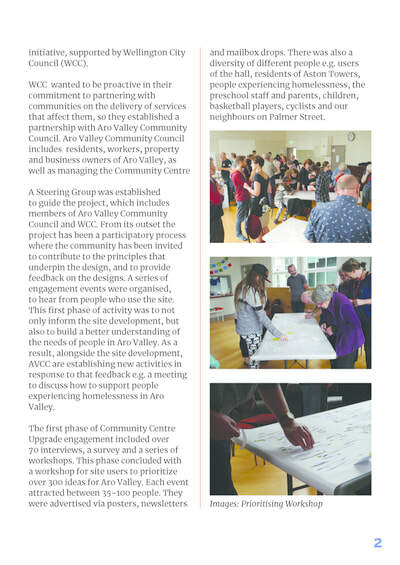 AVCC hired Anne Cunningham and Cally O’Neil to facilitate the community-led scoping. Anne Cunningham and Cally O’Neil prepared a summary report covering up to and including Our Place Our Plan workshop. The independent report provides an overview of the process, insights and recommendations for the next phases of design and implementation. The accompanying summary lists all the ideas raised by the community, and further highlights the priorities identified through the Our Place, Our Plan workshop. The Steering Group sought an architect to work alongside the community to create a design in keeping with identified community values and needs. WCC led an open procurement process from November 2016-February 2017 and received 7 proposals. 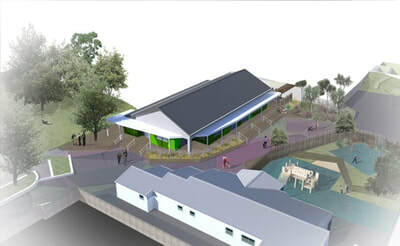 The Steering Group acted as the evaluation panel and chose Jerram Tocker Barron Architects Ltd. While the architect’s contract is with WCC, the Steering Group will continue oversight of the design process and outcomes. Following extensive public feedback on the Community Centre, its facilities and its future, AVCC hosted a series of design workshops (design charrettes). The purpose was to progress to the next phase: site and building design. 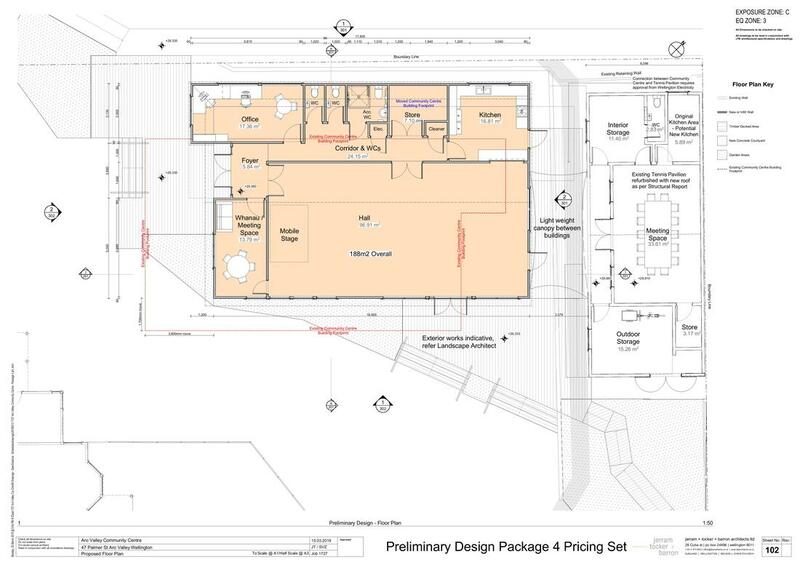 The workshops used an enquiry by design structure to build on the ideas already raised, and start drawing plans. Participants discussed and drew possible design solutions of the upgrade. 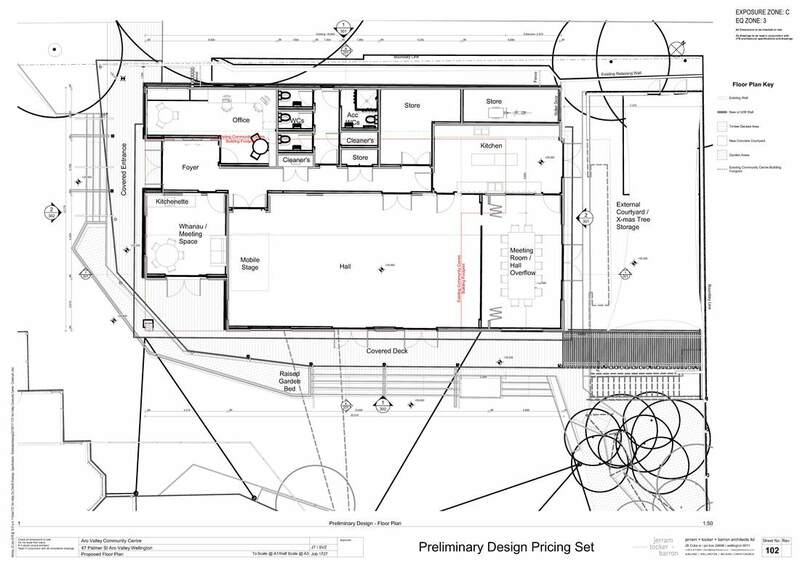 Architects' report on the Charrettes and Design Brief. 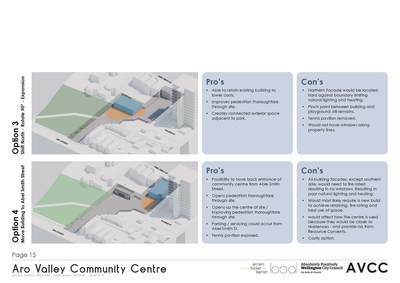 Concept designs will be presented by the architect for further community consultation. 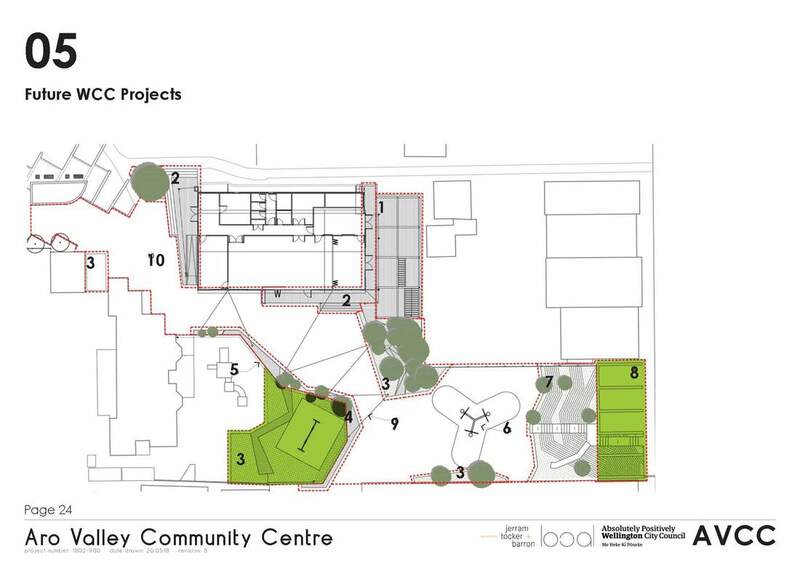 Designs will be completed by the architects and engineers, and submitted for building consent and resource consent. The site construction timing will depend on the design solutions, and will be programmed with construction tender. 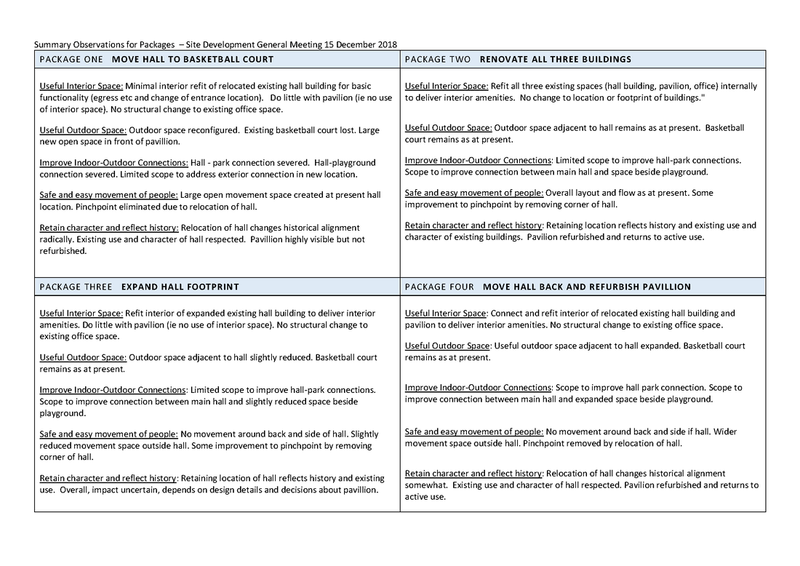 It's time to look at options for the community facilities upgrade. 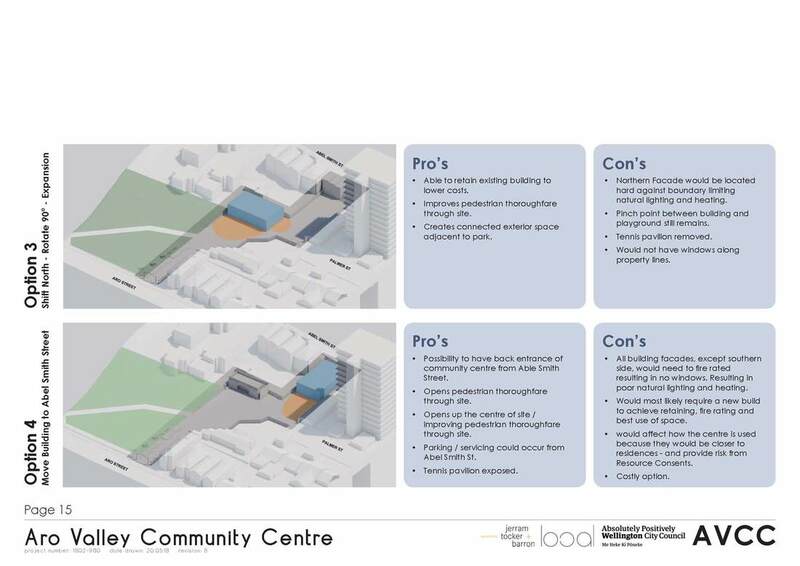 The architects have considered the community's views and developed 3 concept designs for feedback. 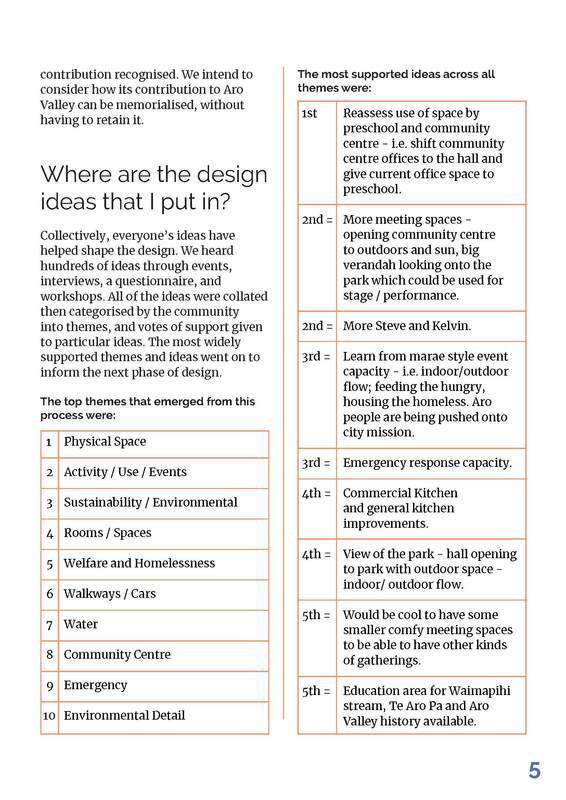 This is the design stage with the most opportunity for community input. The designs will be on display in the Aro Valley community hall from Friday 15th September to Wednesday 20th September. The hall can be open extra hours Monday-Wednesday so get in touch if you can’t make these times and we can arrange. Sunday 17th September 4:30 - 5:30pm. Please come along and get your questions answered! 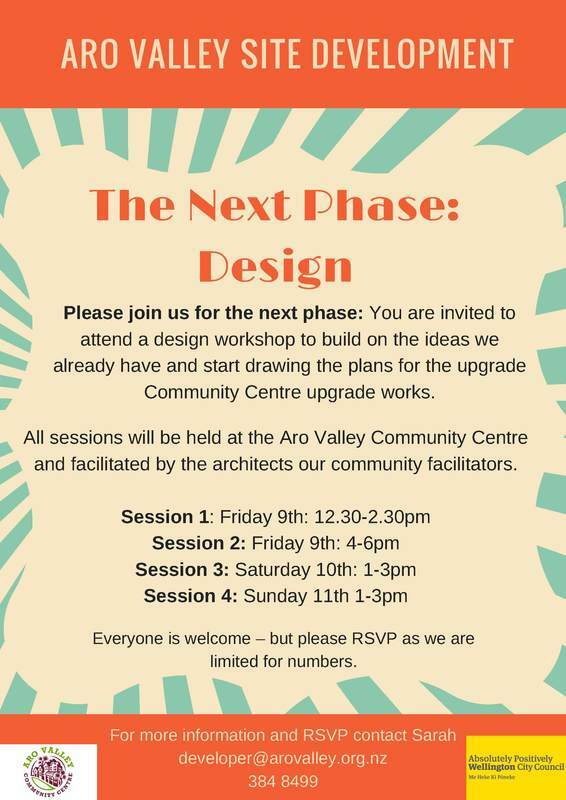 Please join us and play your part in the next phase: You are invited to attend an ‘enquiry-by-design’ workshop to develop and draw possible design solutions for the upgrade works. 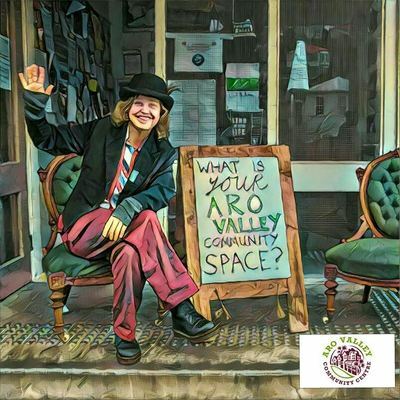 This is an interactive public meet up which will include breaking into groups to help form the design and of the upgrade for Aro Community Centre. 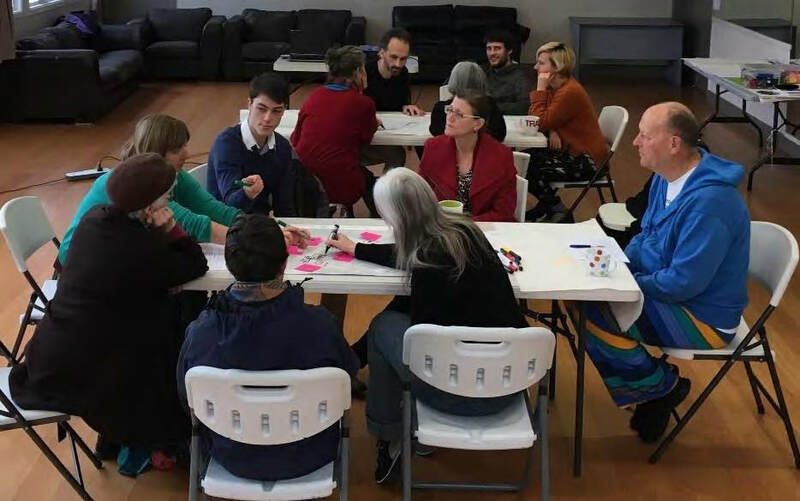 Find out what ideas we’ve gathered as a community so far, what we’ve learned about our values and priorities, and the next steps in the participatory design process. Discuss, develop and draw possible design and solutions with our consultants. These will help inform the brief for the design. 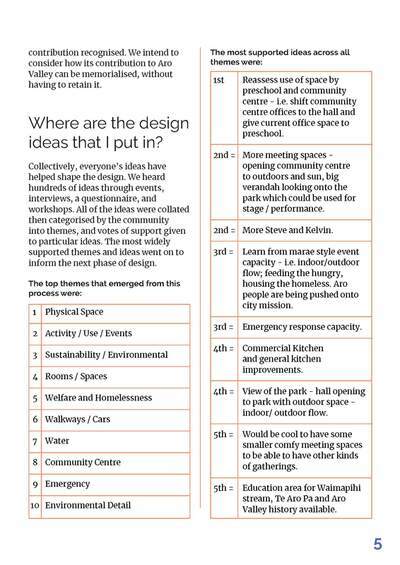 Some of the ideas speak to community development and social topics and events. 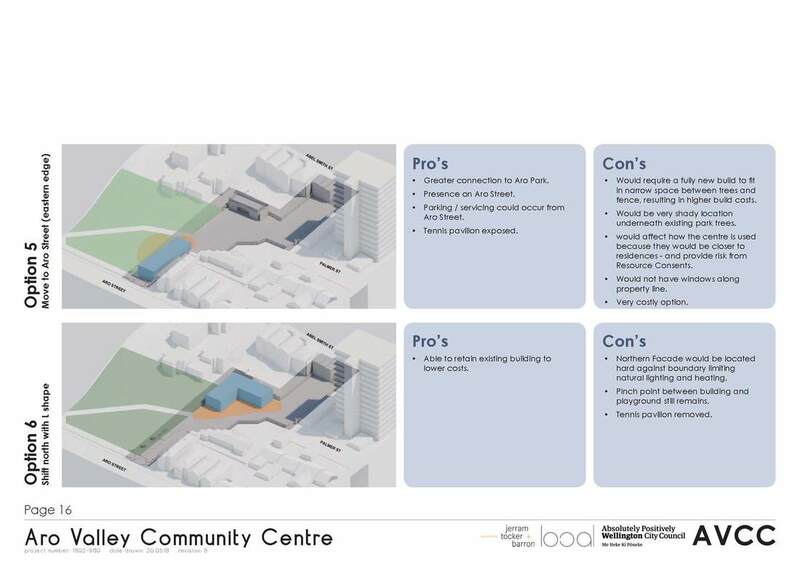 Where possible these be incorporated into the design brief, and ideas these fall outside the scope of building works or the conditions of the funding for the project, they can be used as a starting point for other community development discussions in parallel to the site development project. 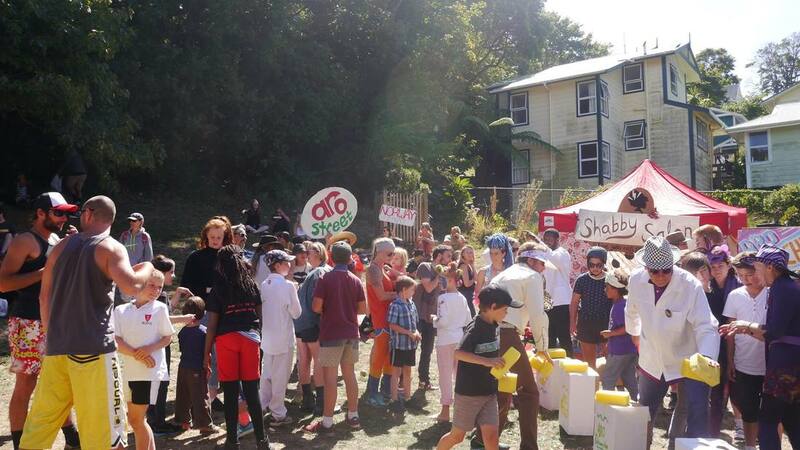 On the weekend of 18-20 November we saw a series of events focused on developing Aro Valley's common spaces. This built on a month long programme led by participatory place makers, Anne Cunnigham and Cally O'Neil. 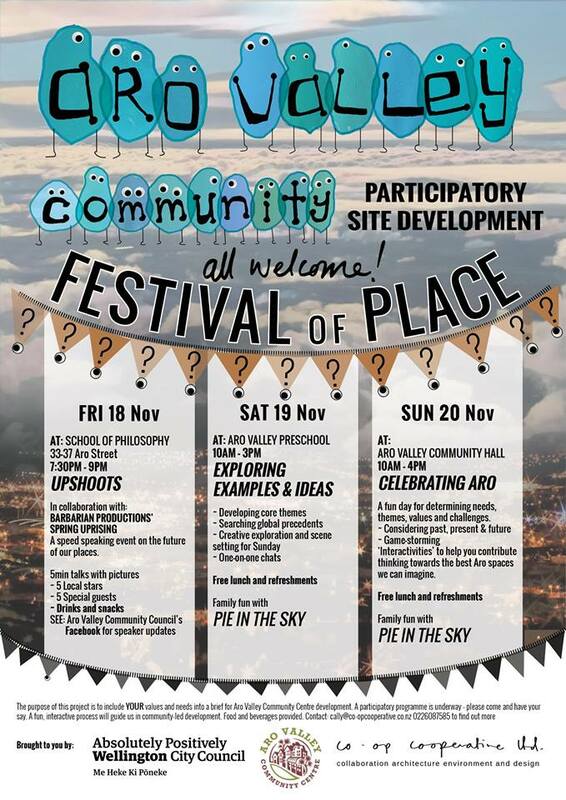 These events were all part of the Festival of Place, which you can read more about here or in your copy of the Valley Voice. 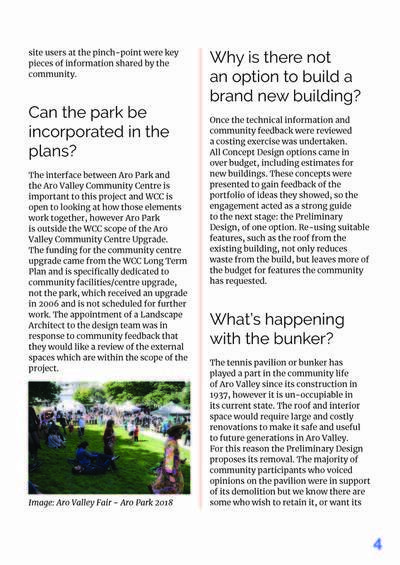 The next step is to work with the AVCC to reach deeper into the Aro Valley and connect with a whole range of people in the community. 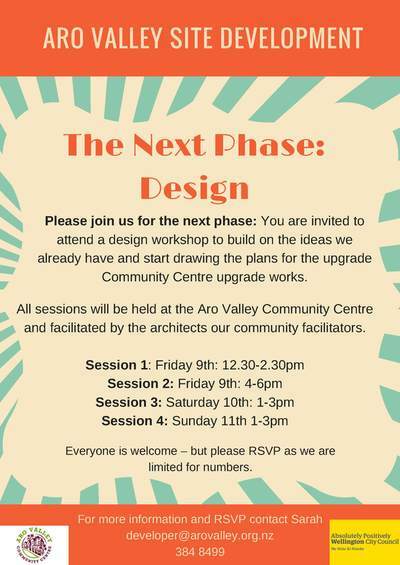 If you are interested in volunteering during this phase please get in touch with Sarah at devlooper@arovalley.org.nz. We would also love to hear from you about your ideas and opinions. 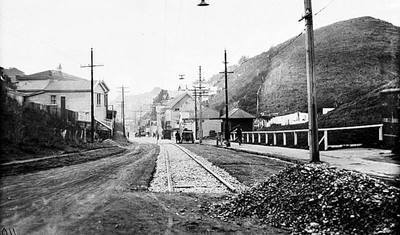 Please fill out the questionaire to contibute to improving Aro Valley.